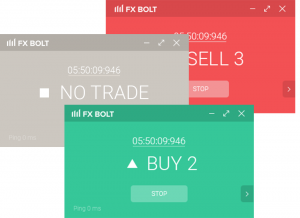 Once a trade signal (Buy, Sell or No Trade) is received, the FX BOLT immediately clicks on the previously set click on your desktop. If you receive a SELL1 signal, this will force the FX BOLT to click all previously set SELL1 clicks on your screen. In the default settings, lower Tier clicks will be executed on higher tier signals. That means if you receive a SELL3 signal, it will also execute all SELL1 and SELL2 signals. If you would like to change this, check the box for the ‘independent triggers’ option in the settings menu. If checked, SELL3 signals will ONLY execute SELL3 click. Same goes for the BUY triggers. Simultaneously with the signal, the background color changes, and the clock freezes at the time the signal is received. After 5 minutes in freeze mode, the application will switch to the next trade setup and the clock will resume. Following the reception of the signal, you can start to set the clicks for the next trade.